This week, we will be discussing Leaders and Enders and whether you multitask when quilting. Do you work on one project at a time or are you better when you are juggling 2 or more? I fell in love with the Leader/Ender (L/E) concept shortly after finding Bonnie Hunter’s website Quiltville.com. 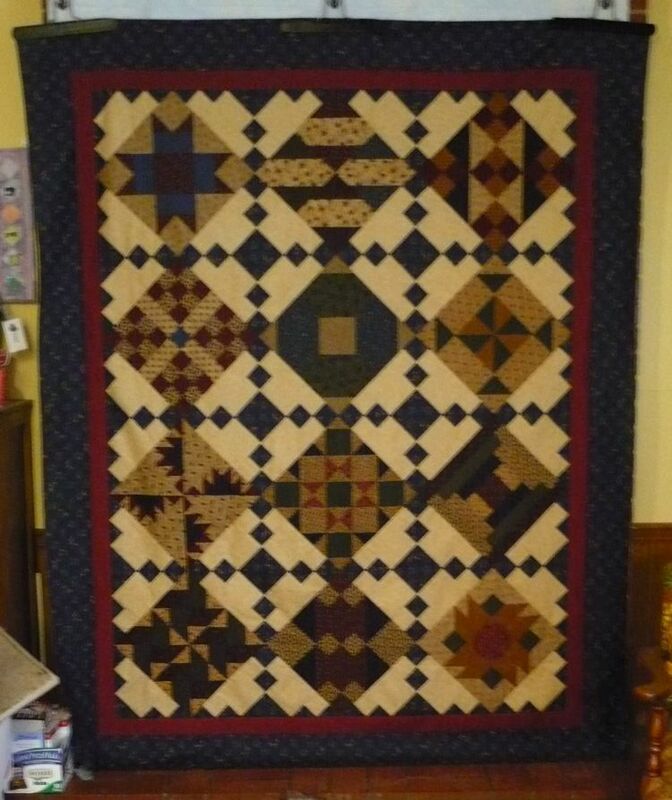 At this point, I can’t remember what my first project was, but I have been known to complete entire quilts including sewing the blocks into rows as a L/E. As a result, I’ve been able to finish lots of tops and do the boring stuff while working on the fun stuff. In January, I decided I was going to focus on my UFOs and I didn’t have anything appropriate already in progress, that didn’t require thinking (very important) for L/E. That lasted for three weeks. At that time I started sewing patches together for Fun With Bricks. This project is nearing completion, but now the short seam is 8″ and that’s getting a bit large for L/E. 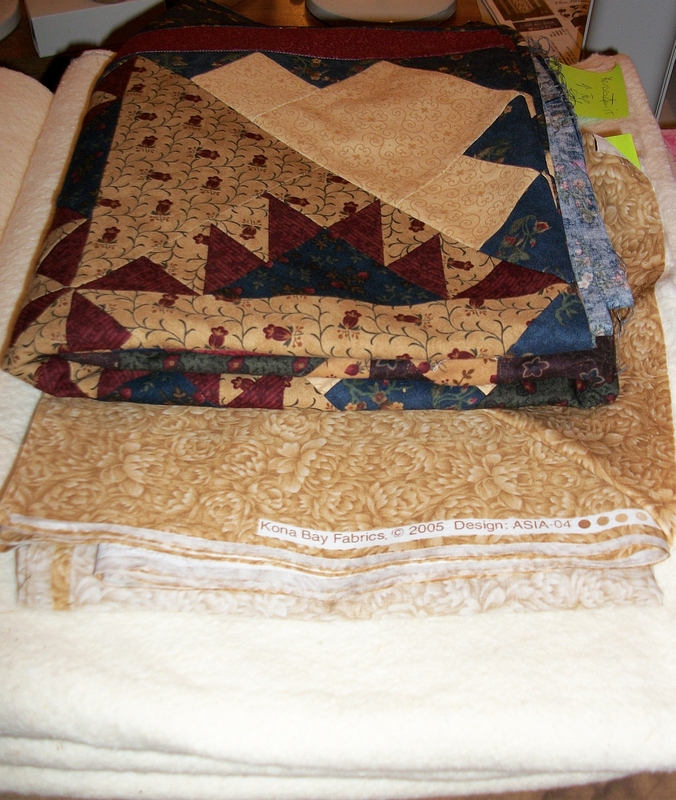 Of course it might have something to do with my last piecing project had 2″ finished blocks! Since I got back from the quilt retreat, I’ve been focused on a single project – the Miniature Ohio Star. 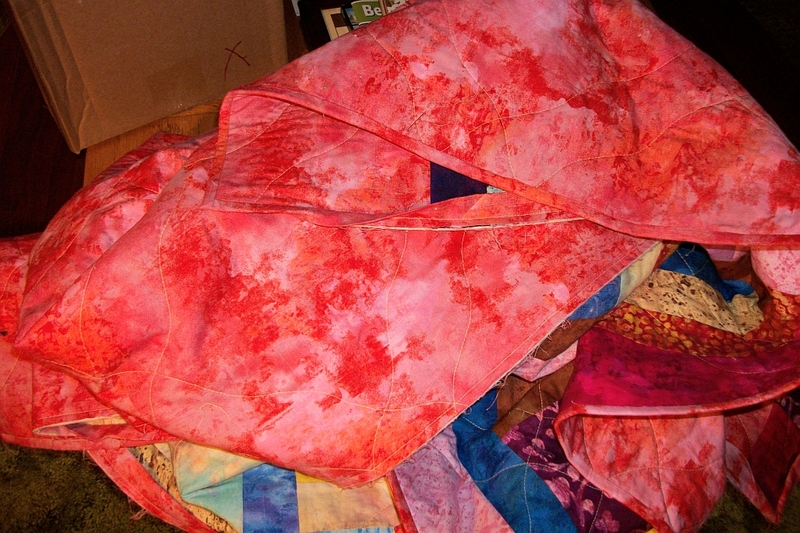 Then I started in with quilting. Although I now have 3 machines, if I’m quilting, I get focused on that. So, I started to say at the beginning, I’m currently only working on one project. But upon reflection, that’s not quite accurate. First up is The Chain Event. 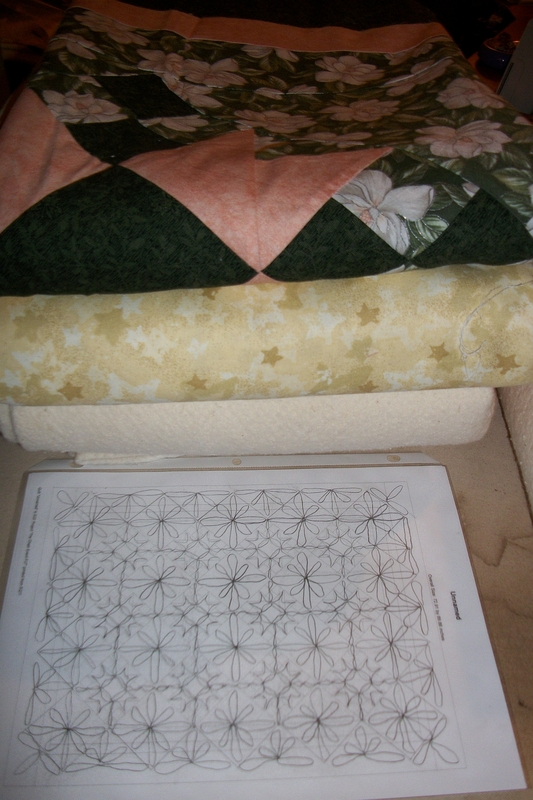 Although this quilt was prepped for the long arm last week, I’m still reviewing my quilting plan. I’ll go over it a couple of more times before I load the quilt on the long arm Saturday morning. It looks huge, but that’s because it’s attached to the leaders. Tonight I made the backing and cut the batting. 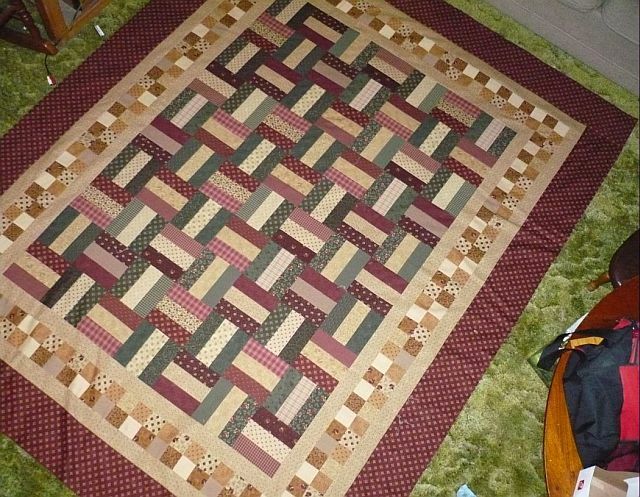 I’m still debating the quilting. The original had swirls through the rail fence blocks and grid work in the borders. I’m leaning toward an all-over design, but I’ve got to get it down by Saturday. Somehow I don’t think daisies or dragonflies is quite the right motif for a quilt for my FIL. 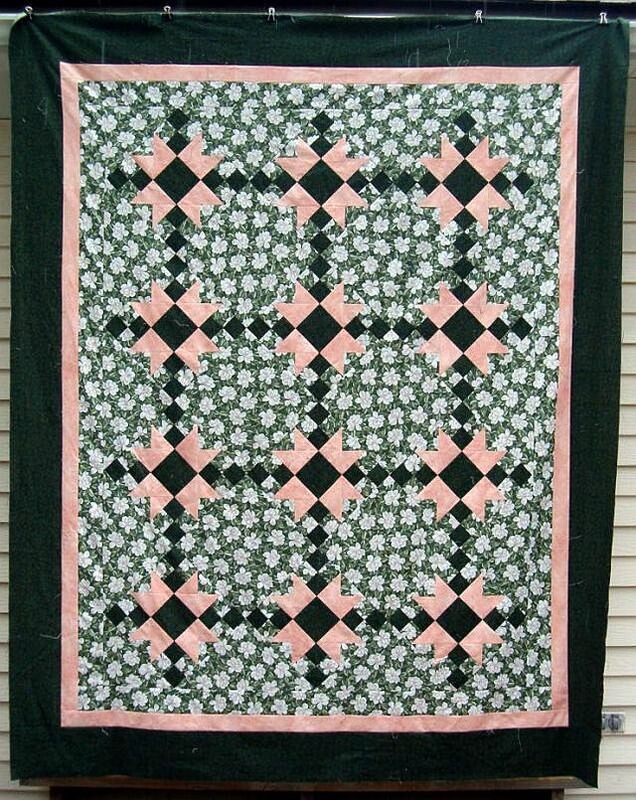 Since it’s a sampler quilt, I can’t decide if I want an all-over design, one design repeated in all of the blocks and another the setting blocks or go custom. I figure I have until Sunday morning to figure this out. The backing and batting were prepared this evening as well. 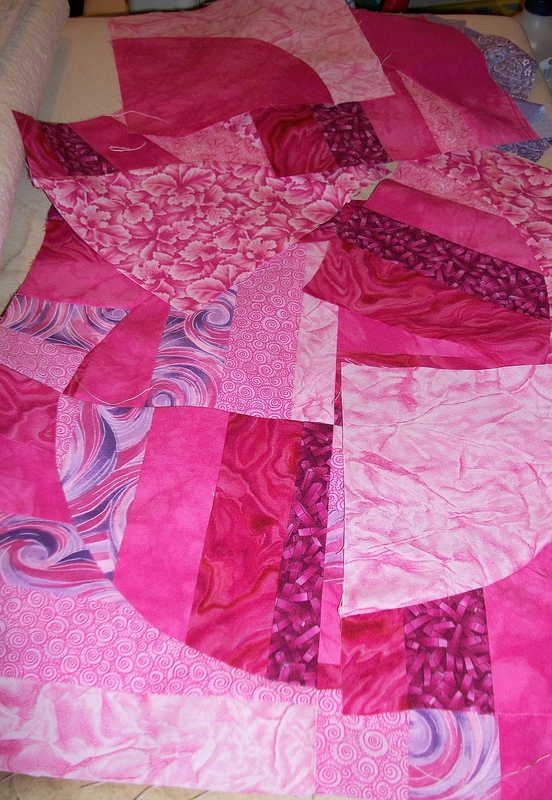 Yes, those block/pieces are pink and I’ve said the Crossword Puzzle quilt will be red. Well, since I think I have just enough red fabric I thought I should play with some other fabric and I pulled the pink/purple box down. I’m not certain I’ve achieved what I envisioned, but time is short and I need to get this done, so I’m going with it. The pieces were cut with a Go! cutter, some after I ‘made’ fabric out of strips. I’ve also been stitching down the letters — I think I have 20 more to go. In between all this other work I’ve been doing I’ve been stitching on the binding. 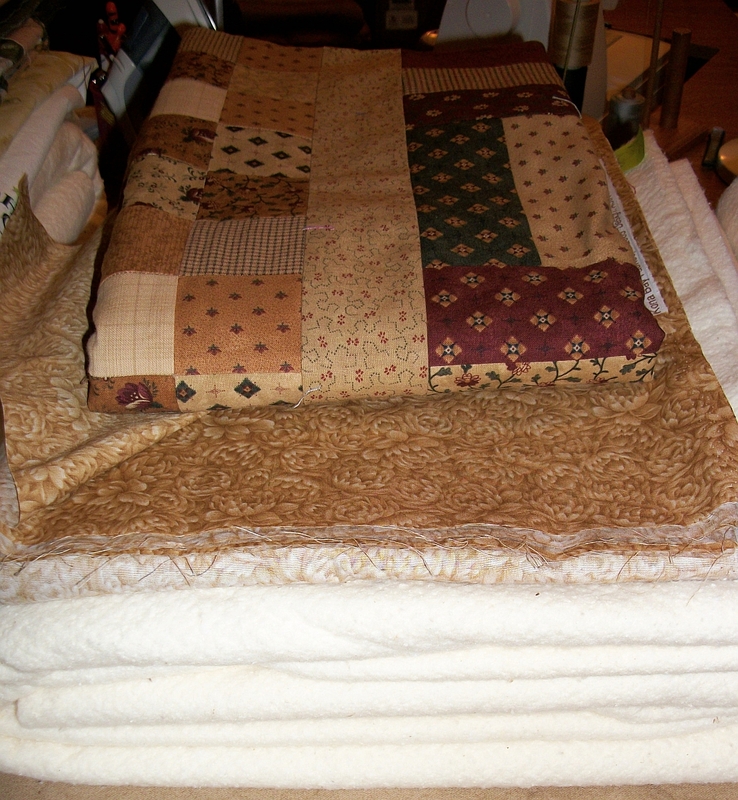 I WILL take the time to get the binding correct so I can machine finish it on these next quilts. If I don’t I’ll never get them all bound by the time I have to give them to the recipients. I clearly wasn’t thinking straight earlier in the week when I tossed in the towel and decided to hand stitch the binding. I’ve worked on it for 3 or 4 nights and I still haven’t hit the 1/2 way mark. I can only do 3 or 4 needle fulls of thread before my wrist starts to ache. So, do I do better when I multitask? I think so. I found out quickly in January that when I have to focus on just a single project – especially when I’m working toward a deadline – it takes the fun out of quilting. To see what other think, check out the links over on Jill’s blog. Well, those are all awesome projects! You are definitely getting things done! Beautiful fabric! And so many fun projects. After all, quilting is a hobby and I suspect we are supposed to have fun, right?! great colors I love summer time, I would agree that it’s going to be a lot of binding over the next few weeks.